Today I had to come up with two cards for my Live Bingo event. I like to design cards for this event a little simpler than normal for this event. The possibilities are endless with the Broadway Bound Suite. The Speciality Designer Series paper in this suite makes card making so easy. One side of the paper is bright and cheery, while the other side is Basic Black, Whisper White, Gray Granite and Gold Foil. I love the way this card turned out. What do you think? I love to hear your comments. If you would like to create one of these for yourself, you can shop from my online store anytime!! 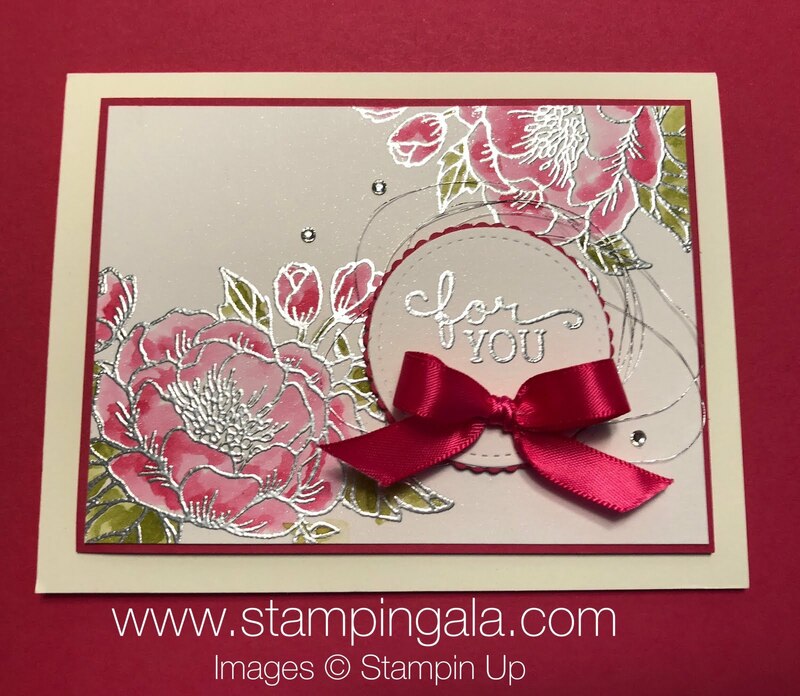 Thank you for choosing me as your Stampin’ Up Demonstrator!! The Birthday Blooms stamp set has received lots of love from me over the past few years. It is one of those sets that is so easy to create with. I am so sad it is retiring. The image looks so stunning when embossed with silver. I also used the Aqua Painter to water color on Shimmery White card stock. The Metallic Thread and Rhinestone Basic Jewels give it the finishing touch!! Here are the products you need to create this card. I hope you were able to join me for my Facebook Live today. I demonstrated how to create these three projects using the Lemon Zest stamp set. 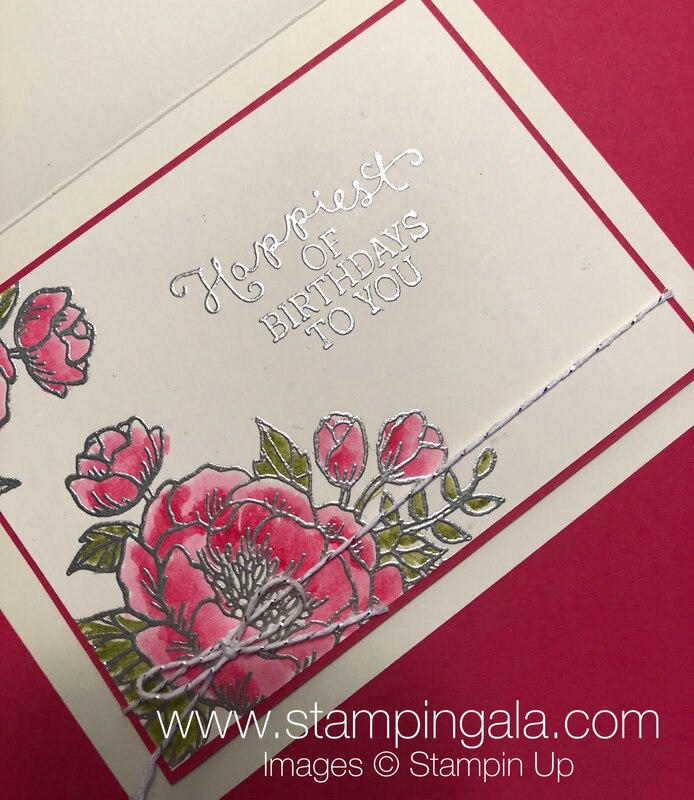 If you were not able to join me live, you can still view the recorded video on my Facebook Stampingala Stampers Group here. First, I created this birthday card. I think this is perfect for spring or summer birthdays. Next, I created a tall box to hold Crystal Lite Lemon Ice Tea packets. And finally, I created a box to hold, what else but Lemonheads!! The Lots to Love Box Framelits Dies makes this box quick and easy. You can download the project sheets for all three projects by clicking on the links below. Remember to place an minimum $30 online order (before shipping and tax) and I will send you all three make and takes for FREE!! Just click on the SHOP NOW button on the right hand side of this blog. If you like these projects, please remember to pin them on Pinterest. Thank you so much for helping me to share my projects with others!! SaveSaveSaveSaveAs always, thank you for choosing me as your Stampin Up Demonstrator!! Are you in need of some birthday cards?? This is a quick and easy card that you can make to have on hand for upcoming birthdays. It works well for just about anyone….male or female, or any age. Try changing out the color for different looks. I paired our brand new Better Together Stamp Set with our Pop of Pink Designer Series Paper. I also tried out our new Layering Oval Framelits for the first time. I love all of the options this new set allows you. Here is a look at the inside. If you would like the PDF for this card, please make sure that you are subscribed to my newsletter. You can subscribe on the right side on my blog. Another Birthday Blooms card for you, this time featuring the stained glass technique. 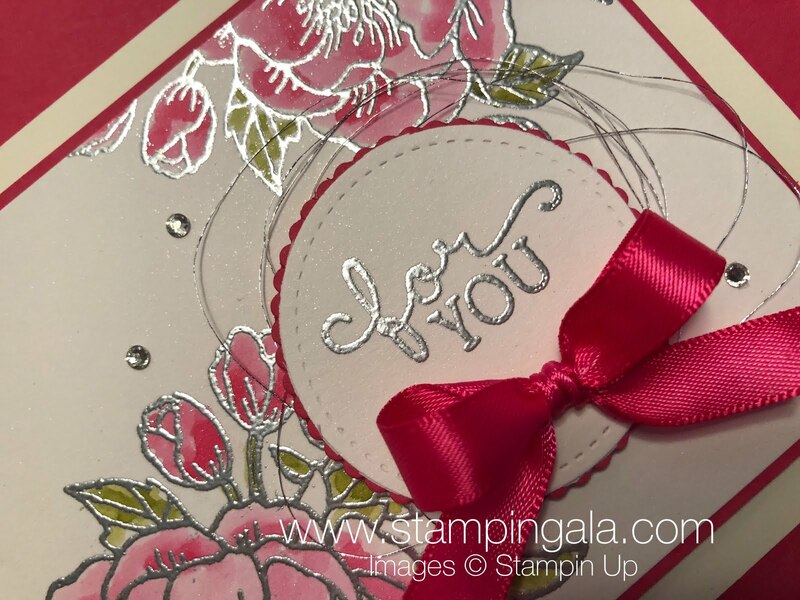 I enjoy working with embossing powder because it gives the image a very polished look. The stained glass technique partnered with embossing powder, is just a bonus. If you like the video you may want to subscribe to my YouTube channel. I am planning on doing two videos per week. That way you won’t miss a thing. MY PROJECT SUPPLY LIST, PLEASE CLICK ON PRODUCTS TO ORDER ONLINE! !